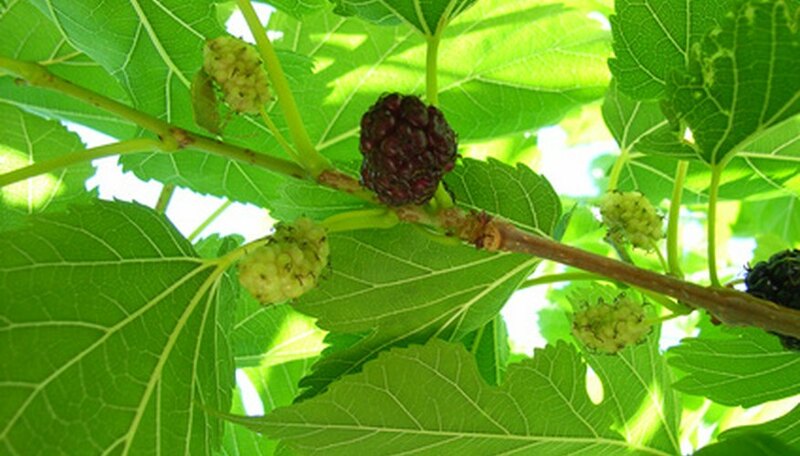 Mulberry trees provide food for both animals and people. Birds, silkworms and other wildlife have been eating mulberry leaves and fruit for centuries. Humans have been eating the abundant, lush berries of the mulberry tree since Roman times. Although the mulberry tree originated in China, it is currently grown in multiple countries. Mulberry trees, as beneficial as they may be, were not commonly planted near homes due to the mess left behind from the ripened fruit falling onto the ground. Mulberry trees are a fruit-bearing tree that can grow up to 10 feet per year and reach full maturity at 30 feet tall. The leaves of this fast-growing tree are a favorite food of silkworms. The sweet, plump, juicy berries of the mulberry tree provide a delicious snack for birds, deer and other wildlife, as well as for humans. The trees lose their leaves in the winter but come back the following season even more lush than the previous year. The berries become ripe in May. The first documentation of mulberry trees reports them as originating in China. The Chinese discovered that silkworms loved to eat the leaves of this fast-growing tree. The more the silkworms ate, the more silk they produced. The Chinese were the first to cultivate mulberry trees in rows for increased production of silk. In 1733, General Oglethorpe brought 500 mulberry trees to Fort Frederica, Georgia. General Oglethorpe was hoping to increase the silk production in the United States by providing the silkworms with their favorite food, mulberry leaves. Unfortunately, silk production in the United States did not achieve the level of success that General Oglethorpe had hoped for. American explorer and botanist William Bartram wrote about his experience with mulberry trees in his book, "Travels," published in 1773. In 1774, Prince's Nursery began selling commercially grown white and black mulberry trees. George Washington, the first President of the United States, purchased fruit from this same nursery. President Thomas Jefferson had mulberry trees planted every 20 feet at his home in Virginia. The two main cultivars of mulberry trees are the white mulberry and the black mulberry. The leaves of the white mulberry are larger than those of the black mulberry. However, the fruit of the black mulberry is much sweeter than the fruit of the white mulberry. Another cultivar, the paper mulberry, is used extensively in Japan for the production of paper products. Unfortunately, the paper mulberry does not produce fruit and is considered an invasive species in some states in the United States. What is a Fruitless Mulberry Tree?